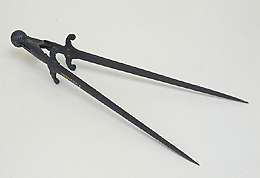 These dividers, in the shape of a dagger, have legs terminating in points, which are not graduated. In the old inventories it was described as a 'dagger in the form of dividers', privileging the design over the function. The black surface bears the inscription 'Volentieri' inlaid in gold lettering. The abbreviation 'B.V.' can be deciphered as Benvenuto della Volpaia, the son of Lorenzo and brother of Eufrosino, who was, like the other members of his family, an instrument maker for the Medici dynasty.